BlackBerry has just announced the Z30 - the smartphone with the largest touchscreen it has even put into production. Moreover, it's the first BlackBerry to ship with the company's latest version of BB 10 OS. 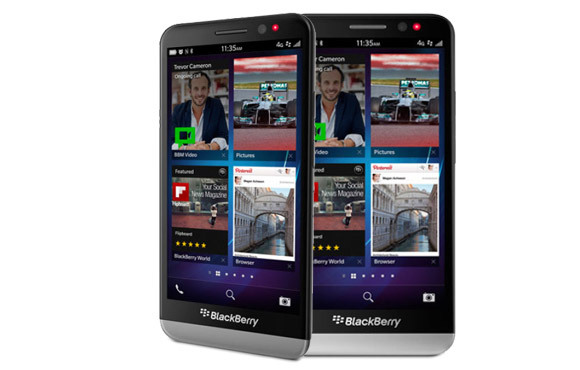 The BlackBerry Z30 is built around a 5" Super AMOLED display with a resolution of 1280 x 720 pixels. This makes the pixel density meter stop at 295 ppi. In its core, the Z30 is powered by a dual-core 1.7GHz Snapdragon S4 Pro chipset and 2GB of RAM. Behind the battery back cover lies a 2,880mAh battery and measures 140.7 x 72 x 9.4mm. The larger battery found in the Z30 hasn't made it much thicker than the Z10 - the difference is just 0.1mm. The BlackBerry Z30 supports LTE as well as dual-band Wi-Fi 802.11 a/b/g/n, Bluetooth 4.0 and NFC. The back of the Z30 holds an 8MP camera with an f/2.2 lens and 1080p video recording capabilities. Video chatting has been taken care of with an 2MP front-facing snapper, which records 720p video. As we mentioned, the BlackBerry Z30 runs BB 10 OS version 10.2 out of the box. It brings some improvements to the BlackBerry ecosystem including BB Priority Hub, message previews in the lockscreen as well as Wi-Fi Direct support, multiple alarms and standard Unicode emojis. BlackBerry Q10 and Z10 users would be happy to know that the company will be launching the BB 10 version 10.2 update in mid-October. There might be some delays, which would be due to carrier approval of the update. آخر پست هم یه ویرایش کوچیک می خواد. اگر وقت بشه کلا برات ترجمش می کنم میدم بذارید توی پست اول.